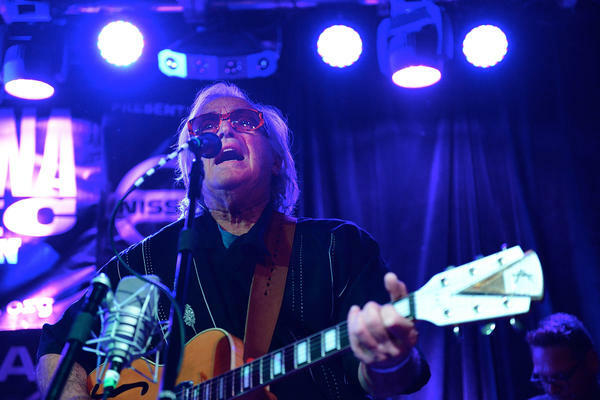 The Prodigal Son is Ry Cooder's first solo album in six years. On it, Cooder makes more traditional American gospel music his own. Ry Cooder has been described as a singer-songwriter, slide guitar hero, session musician to so many other artists, producer, musicologist and historian, a man beholden to no single style, a champion of Cuban and international roots music, and a composer of film soundtracks. Yet, now a half-century into his prolific career, Cooder continues to carve out new trades for himself. Six years since he revived protest music with Election Special, Cooder has a new solo album out. The Prodigal Son features a mix of original compositions as well as some beautiful obscurities unearthed from the American country, gospel and blues catalogs. It was Cooder's son Joachim who planted the idea that his father turn his passion for gospel music into a full album. "We had been singing a lot of gospel music together and that's something that I love so much, always have," Cooder says. "I'd never considered doing a whole record of it though because ... if you're going to sing it, you gotta nail it. You gotta really bring it when you come." But after that talk, Cooder says he found himself going back and looking for songs that he thought he could sing and then looking at how best to make the songs his own. That's evident on the album's title track, "The Prodigal Son." While it comes right from the New Testament, the song also name checks the great pedal steel guitar player Ralph Mooney. Cooder says Joachim had the underlying track from years before and when he found it said, "Here's a good one. It grooves nice. You can play and sing over it." "The Prodigal Son," Cooder agreed, would fit well on top of the track's rhythm, but there was one problem: The song was too short. "The original was a song The Heavenly Gospel Singers recorded ... and the prodigal son left home and then he came back — and end of song," Cooder says. "But what happened in the meantime when he was out there searching and traveling around? I didn't know — the Bible doesn't say." The answer to that missing chapter came, Cooder says, as he sat in the studio. "He wanders into the Hub Cafe in Bakersfield, say 1960, and up on stage he's going to see Wynn Stewart and Ralph Mooney, which you would've seen if you'd have been there then," he says. "And that's it. He says 'Here I shall stand. Here I shall stay. I'll become a servant. Let me empty your ash tray Mr. Mooney. Let me help you if I can.' "
While many of the songs on The Prodigal Son are gospel, others like "Gentrification" put listeners in the middle of a hotbed political issue. "We live in Los Angeles, you see, and this is something we see all around us all the time," Cooder says. "This kind of unbridled, unchecked insanity of building and development and so forth — and so you hear about this and these situations with the rollback of rent control and affordable housing disappearing every minute." Throughout the song, he references some of the issues that arise as tech giants come into markets, often pushing others in the community from their homes. As "Gentrification" and "The Prodigal Son" offer multidimensional and layered tracks, others including "You Must Unload," are strikingly simple. Cooder says he has always loved songs by Blind Alfred Reed, and that this one by the hillbilly fiddler and singer-songwriter is a "sensational song" that still holds up today. Many of the songs on The Prodigal Son speak to religion and spirituality, but Cooder has said before that he isn't a religious person. "There's something about these songs, however you see the world, you can feel the depth of them," Cooder says. "The thing I always found about the gospel music was that it reached further into your being if you like, your mind. It takes hold of you — especially if you sing it and play it." Janaya Williams and Natalie Winston produced and edited this story for broadcast. Wynne Davis adapted it for Web. My next guest has been described so many different ways it's hard to keep track - singer-songwriter, certainly slide guitar hero, session musician to so many other artists, producer, musicologist and historian, a man beholden to no single style, a champion of Cuban and international roots music, composer of film soundtracks. I'm talking about Ry Cooder. RY COODER: (Singing) Well, I used to live on Broadway, right next to the liar's house. GONYEA: His new album features a mix of beautiful obscurities unearthed from American country, gospel and blues catalogues and original compositions. The album is called "The Prodigal Son," and Ry Cooder joins me from NPR studios in Culver City, Calif. Ry Cooder, welcome. COODER: Hey there, Don. Thank you. GONYEA: So this is your first solo album in six years. Let me let you describe what you wanted to do when you started making this record. COODER: Well, the best way I can put it is to say that my son Joachim came to me one day. We had been on tour with Ricky Skaggs and the White family, and we had had a good time. And we had been singing a lot of gospel music together, and that's something I love so much - always have. Well, I'd never have considered doing a whole record of it, though, because that music, something you - as Ricky said, if you're going to sing it, you've got to nail it, you know. You've got to really bring it when you come. So it amounted to me going back to the repertoire, you might say, and looking for songs that I thought I could sing and would like to sing and then kind of searching for a way to do it. GONYEA: Well, let's get right into hearing some of it. This is the title track. It's called "The Prodigal Son." GONYEA: That title - "The Prodigal Son" - it's right out of the New Testament. Then, out of the blue, the song name-checks Ralph Mooney, who, if my memory serves me, is a great, old metal steel guitar player, right? COODER: Yes. Yes, you're right, Don (laughter). GONYEA: What's going on there? COODER: Well, it was a track - Joaquim had this track from years and years ago. I mean - and he said, here's a good one. It grooves nice. You can play and sing over it. And I thought, yes, prodigal son would fit over this rhythm in it. Well, it was too short. The original was the Heavenly Gospel Singers - a song the Heavenly Gospel Singers recorded in 1930, let's say. And the prodigal son left home, then he came back. End of song. Well, it's too short. Well, what happened in the meantime, you know, when he was out there searching and traveling around? And I didn't know this, and the Bible doesn't say. So I was sitting at their - in the studio one day, and it popped into my head. I know. He wanders into the Hub Cafe in Bakersfield - say, 1960 - and up on stage, he's going to see Wynn Stewart and Ralph Mooney, which you would have seen - you would have seen them if you'd have been there then. And that's it, he says. Here I shall stay, and here I shall stay. It popped into my head, and I sang it, and I liked it. GONYEA: There are some old obscurities on this record but one of the ones you wrote - and you wrote it with your son Joachim, I believe - it's called "Gentrification." COODER: (Singing) She said, trust me and take a little tip. This building's been sold to Johnny Depp. Who? Take the buyout, relocate. The Google men are coming downtown, so don't be late. GONYEA: That puts us smack-dab in the middle of a hotbed political issue today. COODER: (Laughter) Yes. (Laughter) Well, we live in Los Angeles, you see, more or less. And this is something we see all around us all the time - this kind of unbridled, unchecked insanity of building and development. COODER: (Singing) Can't understand why an uptown Google man wants a downtown room like mine. Gentrification. These situations with the rollback of rent control and affordable housing disappearing every minute. GONYEA: You talk about the Google men coming to town. COODER: The Google men come around, and they just reorganize everything. And we're here now, so everybody get out, and we're going to take over the place. And, you know, that's Los Angeles and San Francisco and Oakland and other places. GONYEA: There's a very striking piece of simple gospel music on this disc - it's a song called "You Must Unload." I understand it's from the 1920s. COODER: (Singing) Now, you fashion-loving Christians sure give me the blues. You must unload, you must unload. You'll never get to heaven in your jewel-encrusted, high-heeled shoes. You must, you must unload. GONYEA: So many of the songs on this new CD do speak to religion or spirituality. And I've seen you quoted as saying you're not a religious person. So is it simply a love of those old gospel songs, or is it somehow still the message that you like and that comes through? COODER: Well, there's something about these songs. However you see the world, you can feel the depth of these songs. It's - I like my baby done left me, and I'm going down the road feeling bad and all that kind of thing, too. COODER: ...And doo-wop. I love all that stuff - everything. But, on the other hand, the thing I always found about the gospel music was, it reached further into your being, if you like - your mind, you see. It takes hold of you, especially if you sing it and play it, I always found. Isn't this something, I used to say to myself. Wow, I really feel this. This is - you're going somewhere. It's like a magic carpet. You let it happen. So without being religious in an organized sense - I mean, I'm not that kind of person, but I really feel it's very moving. And I try to do - I try to bring that. COODER: (Singing) For the way is straight and narrow, and few are in the road. Brothers and sisters, there is no other hope. GONYEA: We've been talking with Ry Cooder. His new album is called "The Prodigal Son," and he joined me from the studios of NPR West in Culver City. Ry Cooder, thank you. COODER: (Singing) You must unload. Transcript provided by NPR, Copyright NPR.